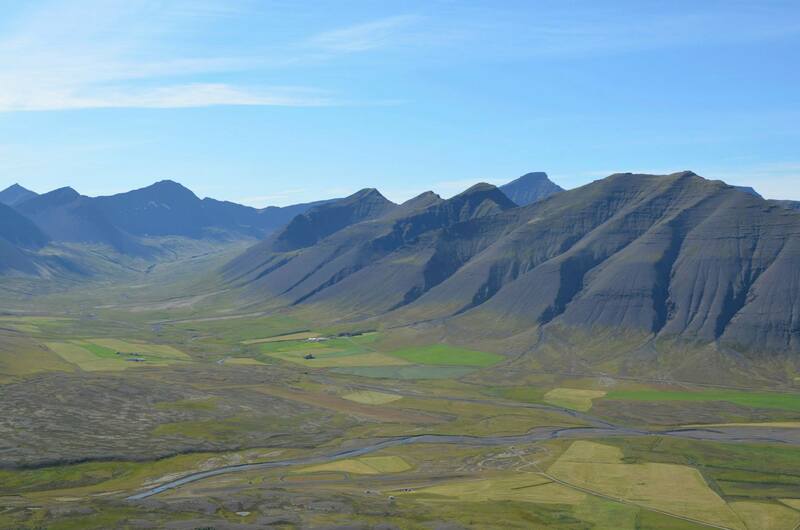 I somehow found a way to make up for my lack of climbing trees as a child by climbing the mountains here in Iceland. There is something deeply ethereal about the summits of them, as if you’re breaching upon the surface of some alternate realm. It enables your senses to occur with more saturation, more intensity than a dream. I came to this realization I can never claim that only one reality exists; reality is altered at the tops of mountains, and it shares itself exclusively only to those who seek it. 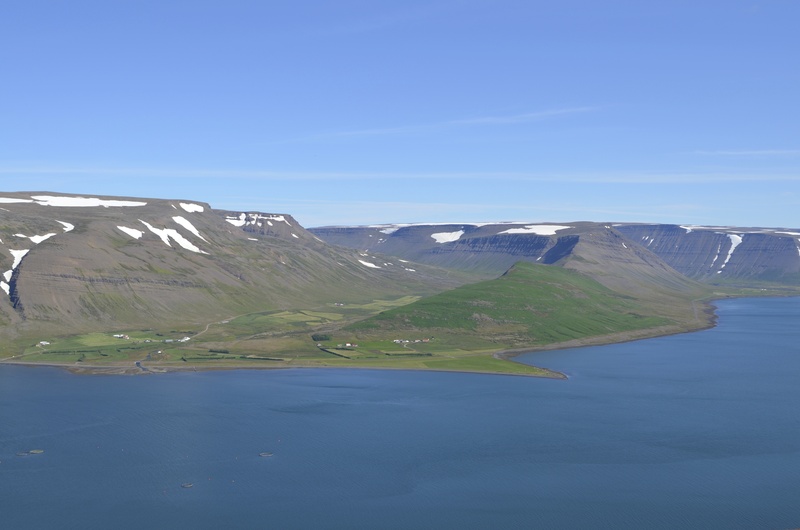 In the moment I climbed Sandafell, the small mountain rising above the small fjord town of Þingeyri, I found a settling and a heaviness in myself, as if I was being pulled down into the mountain. I found truth in the most insistent gravity; my feet met the rocky peak like a finger touching a mirror, we mimicked each other as my feet pressed into and off of the surface. There was a moment of stillness on the summit where all sounds lacked their own lingering presences and all wind held its breath. They were hanging in the air above me like a quiet glass chandelier, I was watching in awe, I was watching the exquisite stopping of time, I was watching, all awe, everything. There was another moment near the summit where I stood on this large cement pedestal jutting out of the ground, and as I stood there overlooking the quiet landscape, I lost all present and future urge to remove myself from this height. My feet were firmly ground into the structure and I felt like I was an extension of it, we experienced the stillness together. I had considered it something to be thankful for because in all its manmade glory, it helped me inch a little closer to the true elevation of the peak. It was a false elevation compared to the true unkemptness of the mountain, but an elevation nonetheless. I thought about the word “elevation” for a long time on that pedestal, and couldn’t tell who was more elevated: myself, the mountain, or the small pedestal frozen in its attempt. I saw this mountain across the valley from my own, it was shaded by brilliant violet shadow, and in it I saw a strange personification. It looked as if someone had taken a multifarious sunflower and spread its petals back, so that the highest point was the heliocentric center of seeds, formed to a point, reaching the furthest to the sun. All the rest of the petals fell back into an inconsistent triangular prism of sorts, represented by the channels in the mountain that had been eroded by rock and water. It felt like a dreamscape unlike dreamscapes. The opposing mountain across the valley also took on a strangely particular form. It looked as if a giant hand had dug its fingers into the earth and then had given up as it tried to pull itself out of the ground. There is this theory about certain mountains being trolls in Iceland, and the stories go that trolls who hadn’t reached their caves before nightfall froze into giant landforms like this one. Perhaps the wind finally eroded the rest of the troll away leaving only the trapped hand, a reminder of tension and struggle. 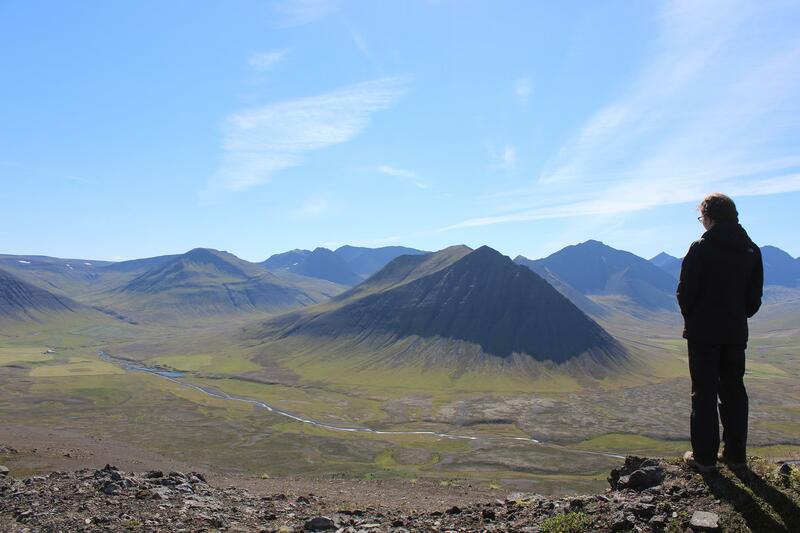 Each mountain seems to personify both a delicacy and a harshness in juxtaposition. 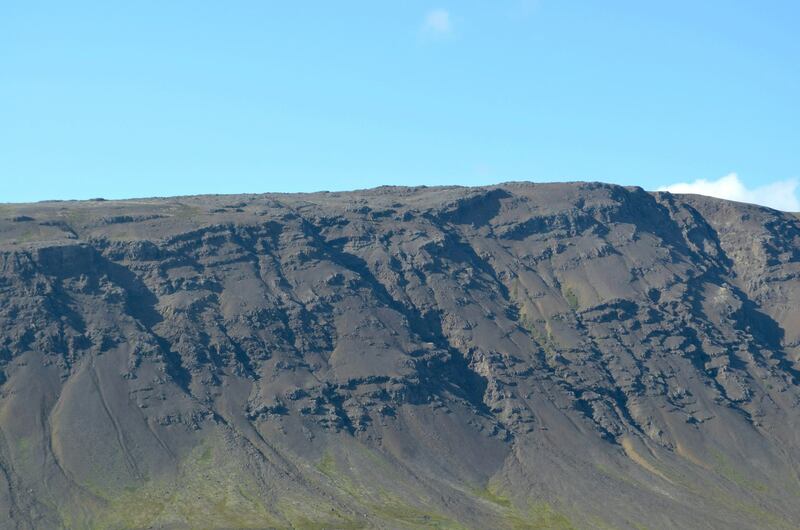 I was conversing with an Icelandic friend about genders of nouns (all nouns in Icelandic either take on a feminine, masculine, or neuter form) and it had occurred to me that I couldn’t decide whether the mountain in front of me at the time on a farm at Hænuvík looked more masculine or feminine. Many Icelanders have said certain words in their language just feel naturally inclined to a specific grammatical gender, but it’s something that I haven’t found as easy to grasp yet. I was torn between the two; the mountain here held such a softness of feminine energy in the light and a deep masculine harshness in the shadows, as other things did. But even further than that, the shadows held this haze of blues and purples that felt more soft in femininity, and the light showcased a harshness in the mountain’s design. Either way I looked at it the mountain was fluid and contained all essences of form. In the masculine energy was the feminine, and vice versa. (Note here that by masculine and feminine I am referring to the idea of energies rather than of human genders). 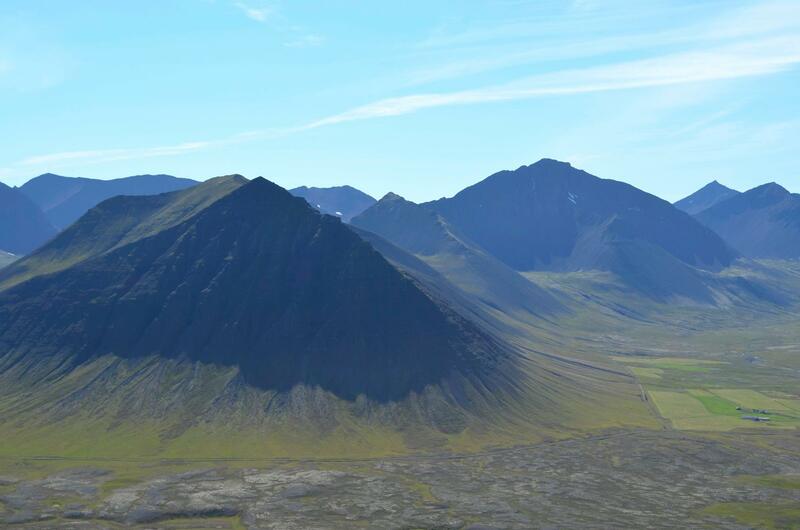 I found another mountain in one of the fjords that I’ve been thinking about constantly since leaving it. It’s the type of contrasted landscape that sticks in your mind after you close your eyes. It’s like the notion of staring at the sun for too long: you can see the impression of it’s blazing orb on the back of your eyelids. I can see the harsh curling outlines of shadows forming patterns in the mountainside, the twisting endlessness of rocks cascading, frozen, against each other. The entire mountainside was a crowd of jellyfish holding onto dear life with tentacles wound around each other. It was collective, an entire assimilation of decisions brought on by nature itself. There is something profound about the intentionality of nature’s intensions. I am reminded of my own acts of creating fine art. An idea creates itself within the mind, desiring to be executed into material form. The idea is a thought within itself that must be committed to be solidified, and much like the mountain, it attempts to express itself through trial and error until the idea finally bursts through into an epiphany. Once committed into the material world, it works at modifying and rebuilding itself until it has understood that it cannot fully represent the initial idea which it came from, at which point it lets go and allows the freeform of progress work itself out. My art comes from ideas which I manifested into paintings and drawings on surfaces, but the final result never portrays the initial thought. At that point, I teach myself to let go of what I intended, and let the intension itself follow a new path as I unfold more layers upon the artwork. I see mountains as things that paint themselves. They are the artist and the art, the painter who takes the paint from his own material self, picking rocks out of his skin and putting them in new places, creating patterns, letting them fall away, creating new patterns, letting them fall away. The impermanence is outstanding, a craving. And so I take out parts of myself and press them into mountains, let them fall away, take parts of the mountain and press them into myself, watch the rocks crumble from my hands, fall away, create new patterns at my feet. I climb to the top of the summits and I am part of the mountain, I have raised it to new elevations as it has raised my own self. I fall away from the mountain in a flurry of a descent, feet stepping into patterns, I fall away, I fall away, away. 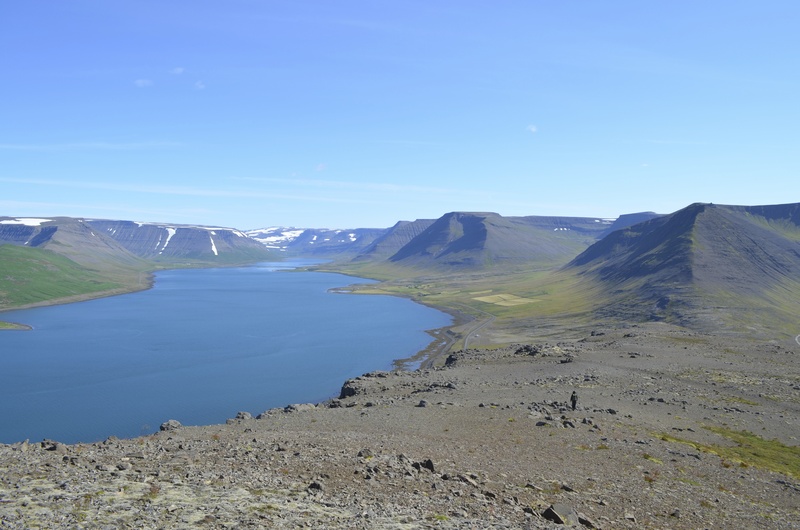 This entry was posted in Uncategorized and tagged Þingeyri, mountains, Sandafell, Westfjörds. Bookmark the permalink.